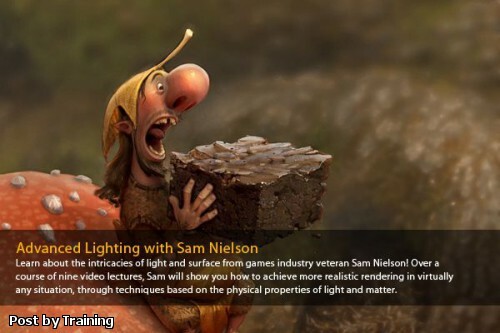 Learn about the intricacies of light and surface from games industry veteran Sam Nielson! Over a course of nine video lectures, Sam will show you how to achieve more realistic rendering in virtually any situation, through techniques based on the physical properties of light and matter. He will talk in detail about different types of light sources and how to combine them, as well as shadows, reflection, the interaction of light with different materials, and much more! In this first lecture, I will start with the basics. I'll talk about fundamental properties of light, different types of light sources that you will encounter in your work, and some simple lighting schemes. I will also discuss Lambertian reflection in depth, including the interplay between bounce light, occlusion, texture, and cast shadows. For your first assignment, you will be asked to paint a simple scene in grayscale using a basic lighting scheme. I will dedicate this lesson to light and surface color: we'll discuss how colored surfaces interact with different colors of light, and talk about common causes of color variation. We'll delve into advanced lighting schemes, and I'll talk about ways to simplify the always-challenging task of dealing with multiple colored lights. For your assignment, you will be asked to paint a simple scene in color with a more complex lighting scheme and different colored surfaces. In this lecture, I will discuss specular and Fresnel reflections, diffuse and anisotropic reflections, specular highlights, and variable reflectivity. We'll talk about global illumination and handling elements not in the scene, such as off-camera shadows and lighting effects. For your assignment, you will be asked to paint a simple scene with global illumination and various levels of reflectivity. In this lesson, we'll talk about translucent and transparent surfaces. I'll go into more detail about Fresnel reflection and refraction, including caustic effects. We'll learn simple ways to handle chromatic distortion and iridescence. I will demonstrate how to paint sub-surface scattering and density variations and talk about the laws that cause them. For your assignment, you will be asked to paint a simple scene of objects with various types of translucency. In this lesson I will talk about the physical properties of a very complex subject: hair and fur. We'll discuss the unique ways they react to lighting schemes. We'll also learn about the essential differences between fur, plastic wigs, and human hair. For your assignment, you will be asked to paint a portrait of a character that is covered with different types and lengths of hair within a pre-determined lighting scheme. Skin is one of the most difficult surfaces to handle realistically! So in this lesson, I will talk about the material properties of skin and how they interact with their surroundings, including what's underneath the skin. I'll demonstrate how to make skin look correct in various lighting conditions. For your assignment, you will be asked to paint a portrait with the attributes of the skin represented in appropriate places. In this lecture, I will talk about properties of atmosphere. We will look at how light reacts to a variety of atmospheric effects, including the object of a continual struggle for serious landscape painters: clouds. We'll discuss common types of atmospheric scattering and demonstrate their uses in painting. For your assignment, you will be asked to paint a simple scene with mountains, clouds and atmospheric effects. In this lesson, I'll teach how to paint water, one of the most complicated materials you'll ever have to deal with. I will describe in detail the laws governing water and the simplest process for handling this complex subject. For your assignment, you will be asked to paint moving water into an existing scene. The series culminates in this final discussion: how light informs and affects the human experience. I will discuss exposure and dynamic range, saturated edges, and enhanced atmospheric perspective. We'll talk about how to steer emotional response with lighting and surface, about visual resonance, and about how experience affects viewer response to the effects we use in paintings. Finally, we'll talk about how to translate all the principles we've talked about into different rendering styles. For your final assignment, you will be asked to paint a simple image using a combination of the effects talked about in this lecture.